Domu is a horrific tale of extrasensory powers, mind control, and psychic warfare as told through the exceptional talent of Katsuhiro Otomo, creator of Akira. 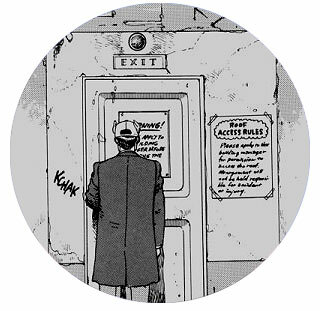 Even at under 300 pages — short by Otomo's standard — Domu is a dense thriller about a twisted old man who takes control of an apartment complex, enslaving its tenants with his psychic abilities. No one seems to be able to find a cause — or a solution — until a young girl arrives to challenge this disruptive force with psychic abilities of her own. Warning — don't read this manga while you're alone in the house. It will spook you senseless. We're not joking, this is a scary tale on the level of Stephen King, and would make one super spectacular movie that would leave your teeth chattering. Otomo's story and art compliment each other perfectly, with his chilling prose highlighted by John Woo style action and David Cronenberg style bizzare-ness. 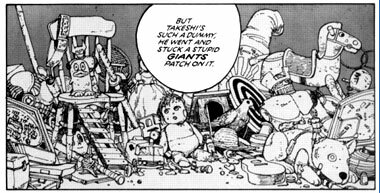 You'll need to read it at least twice however — once to actually READ it, another to savor the magnificent hyper-detailed artwork that is Otomo's trademark.